To drive value and sell you must know the territory. And there are two overlapping territories – that of the customer organization and that of your product. How they interact, and most importantly, where they intersect, must be understood and taken advantage of. If you stop at the customer contact who made the purchase decision, you are missing opportunities. There are two main phases to the approach. First, I work with the technology company internally to define their basic matrix. Then I work with the company to develop the process on how they approach and work with their customers, using the matrix as the map. Define the Stakeholders inside your customer organizations that your product serves. Define the Core Capabilities of your product. How does your product create value for customer end users? 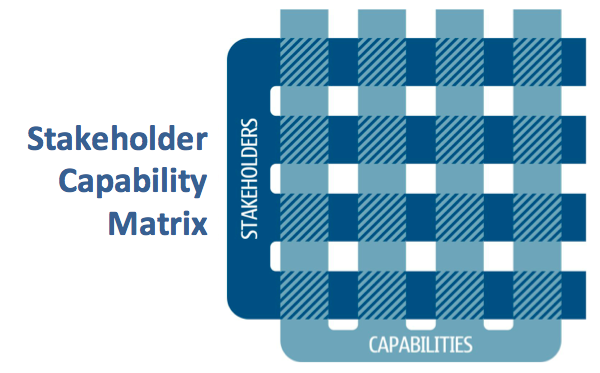 For each Stakeholder / Capability intersection, define how that capability could potentially serve those stakeholders. The technology company needs a methodology on how to do this with their customers. It can take many forms. For a recent customer, we created a new offering “Assessment & Enablement Services”. In it, the technology company runs the project at the customer site, talking to the named stakeholders with the primary customer contact. The conversations are very illuminating, for both the technology, the customer champion, and the stakeholder being interviewed. And they lead to more sales.